When I wanted to make a small rocky garden, I decided to plant any dwarf plants and perennials. I read a rocky garden or alpine garden had been the most famous garden. It was more convenient to make a small hill, as it would be a decorative addition. If one wants to make a little rockery, it's recommended plants should be suitable, especially ornamental deciduous perennials and dwarf evergreens. I read evergreens can range in height and form, they give originality year round in my rocky garden. But there are no slopes or hills in my garden, and I chose to create my special rocky garden. Beside my cottage there is a small patio, which is adjoined to a low terrace, and there I decided to create my rockery. Near decorative supporting terrace wall I planted low evergreens: cypress, juniper, euonymus, periwinkle. Later I added dwarf round tujas, herbaceous plants such as bleeding heart, hostas, dwarf iris, red and white primrose, bugle, loosestrife, chickweed, they form a dense plant hill. I noticed that all plants tend to rocks which quickly warms up in spring. I think if several species grow closely, it is better to divide them with small stones. Spring blooming bulbs are growing there: crocus, muscari, chionodoxa and perennial primrose, viola. Summery blooming are geyhera, hostas, aubrieta, saxifrage, chickweed, creeping thyme, lobelia. 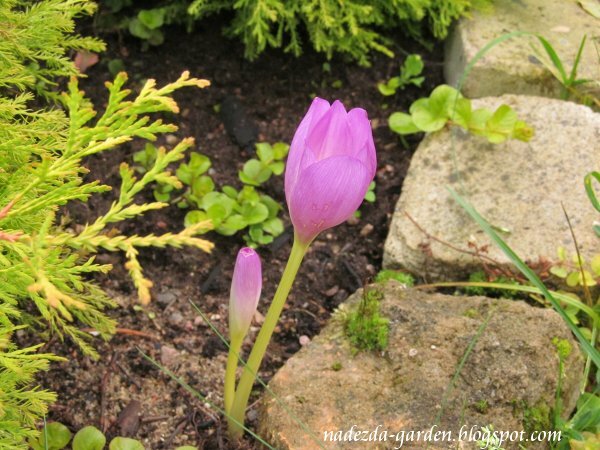 Sedums and colchicum bloom in autumn. Nadezda, your flower arrangements are wonderful. It looks perfectly. I love the stones in the garden. Your rockery is very pretty. All the plants you mention grow in my garden, but full-size. Your rockery sounds like quite a large area. I’d love to create one too, since I already garden mainly on rocks and stones a rockery would be easy. But I find I don’t want to make new beds now. I already have more work than I can cope with. Are you using proper rocks or the artificial, light weight kind? My rocky garden is really small: about 2m x 2m, because the lawn is besides. The big stones are very heavy, Friko. So putting them once I've never moved them again. I move small stones when I plant or change the flowers. Надежда, спасибо Вам за такую красоту! Сад восхитителен! Идея мне очень понравилась. Рада что вам Лана понравился мой небольшой садик, спасибо! Northland is pretty in summer! I notice you mention chickweed - that is a weed here. Are the crocuses only just flowering now? Sue, I mentioned chickweed - Cerastium, it's not a weed here, moreover Cerastium does not winter well and dies in some snowy winters. This year winter was very mild and it grows well and will flower soon. The photo of crocuses was made in April. It seems we have a different plant that we call chickweed. For us chickweed is Stellaria media. IF yours is the cerastium I know it will have white flowers and silvery grey leaves. Not a weed here but very invasive. You're right Sue! My cerastium has silver leaves and white flowers, it looks wonderful between stones. I can't say it's invasive because of the warm time is short and it has no enough time to grow more and more in except of periwinkle, it's grows very fast. 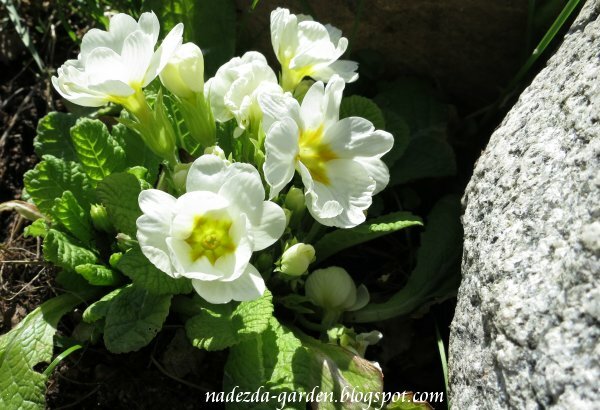 Your small rocky garden is very beautiful Nadezda! 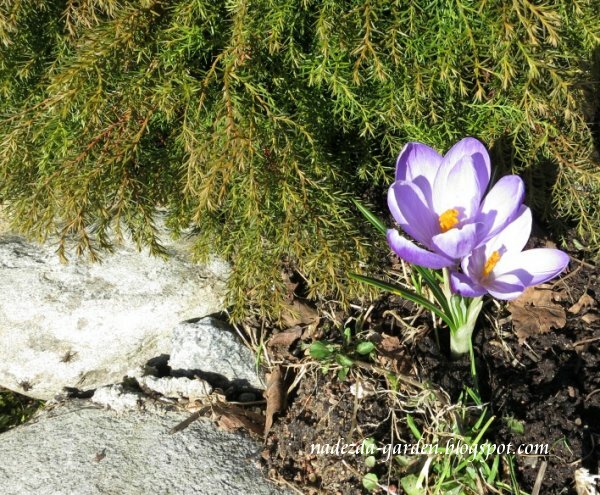 !I like the flowers that you planted !My favorite is the crocus !! I see your new life started, Keith. Hope your fiancee will like garden flowers and butterflies! Your rocky garden looks so beautiful. I have a dream to make a rocky garden with slope and mini waterfall on it. Put some ferns colorful orchid on the rock... beautiful. But it just a dream, I have no space anymore in my garden. I have alocated more space for edible plants. I think edible plants are important too Endah. I'd like to transfer my orchids to the garden, open air, but night temperature does not permits to do. Can imagine how beautiful should be your dream! Nadezda your compositions and spring flowers are beautiful. For me, a lot of these flowers have przekwitło. Well, we have pictures and we admire them. Thank you, Lucia, I tried to make this composition, to combine different plants, have read and looked at the pictures in Internet. I'd love a rockery but there's no room in my garden. Yours looks lovely Nadezda and the flowers are so pretty. Glad you liked my small garden Patricia! My father liked having rock gardens too. He used honeycomb rock (a sort of volcanic rock) to build his up and grew all sorts of plants there. When we were children it made a very nice mountain for toy animals to stand on! You have periwinkles - I like those flowers a lot. I love the stones as well Kirk. They are proper, very heavy ones. You can see birds figures on the first photo, up, right corner. I think any figures decorate the landscape. Thank you! These stones are everywhere near my cottage, proper natural stones. Thank you Elsie! I love your pretty rockery garden Nadezda. Did you move all of the stones yourself? I think that would be hard work! Yes, I did Betty. It was very hard work and I asked the neighbor to help me a little. The small stones are lighter and I did myself. Every spring I clean the soil weeding between stones and I have to transfer them. Thank you Betty! 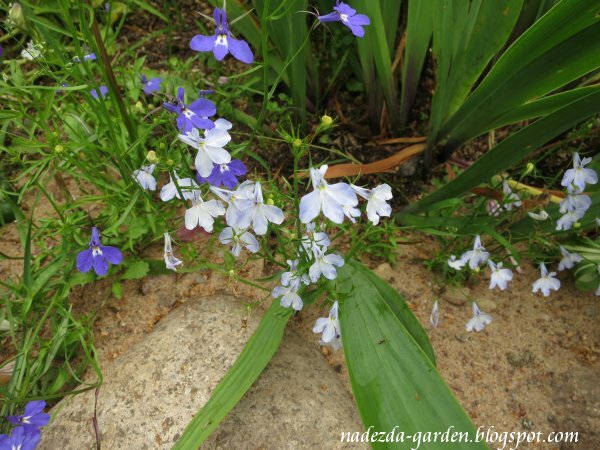 Lovely combination of plants in your rockery, Nadezda! Is that a false cypress in the first and second photo? It's one of my favorite evergreens. It's not cypress Rose, it's not hardy in our climate. I planted Chamaecyparis pisifera 'Filifera nana', that perfectly winters here. Thank you! 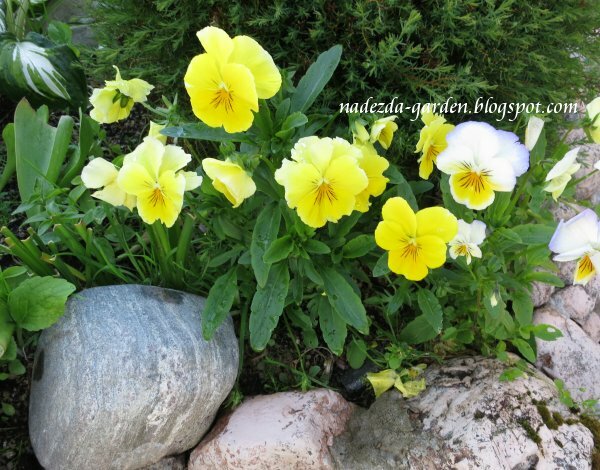 Your rocky garden is very beautiful Nadezda! You've chosen a nice variety of plants for year round interest. I love the first picture with the birds at the top! You're right Peter! All year round I can see this rocky garden, even when snow is on the stones my evergreens look well. Thank you! 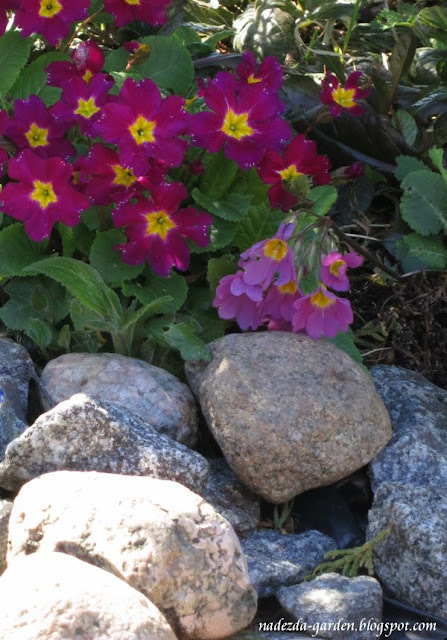 Rocks certainly add depth and character to garden beds and you have some beauties! The plants and the rocks complement each other very well. I tried to do as I've read and seen Astrid. Thank you! Beautiful! Even in the winter rocks are a wonderful addition to the garden. I think you're right about the rocks helping to keep the plants warm. You've created a wonderful little micro-climate. 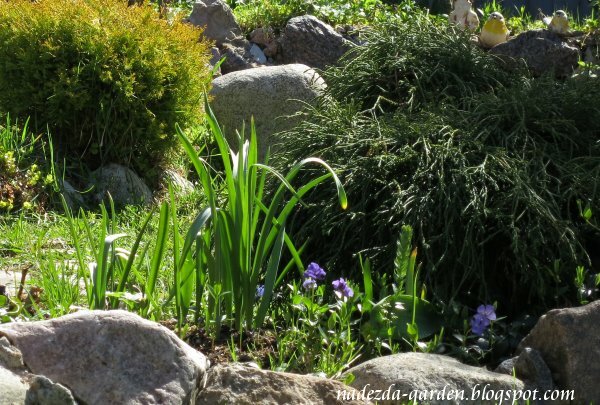 When I get to my garden in early spring I notice that plants sprout faster near stones. You're right Tammy: micro-climate was created in this rocky garden! Very nice! I had never realized that rocks would warm the soil faster but it makes sense. Not only rocks Jason, the fence warms the soil and plants as well. This spring my spireas bloomed very well near the fence except of others beside the cottage. 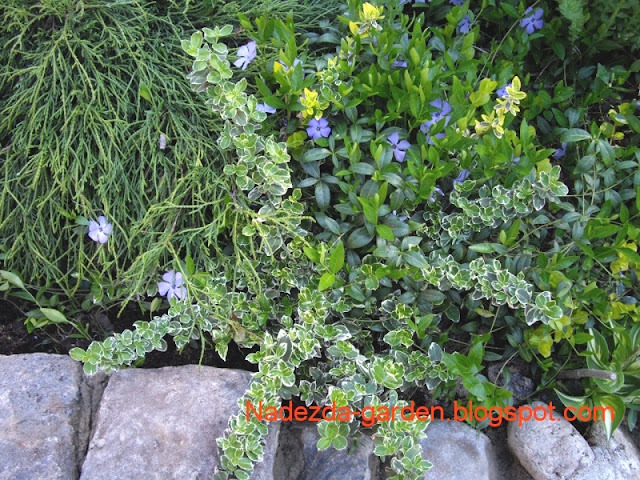 Love your rockery Nadezda and your choice of plants is very suitable. I have also wanted a rockery for a long time, but in my garden there isn’t space for it so my plan is to make a miniature rockery garden in a large container with absolutely tiny plants and very small stones and gravel. Maybe next spring – too busy right now! Watching a magazine I've seen a container garden and it was beautiful so I think your rocky garden will be tiny and very pretty, Helene! You are such a gifted gardener. I always like to see the way you have approached your planting. Glad you liked my small garden, thank you Jenny! Hi Nadezda. I noticed right off on the first photo, the little birds sitting on the evergreen plant. So sweet! I love the addition of rocks in the garden. They provide a nice naturalistic look. Yes, they are, two figures of titmice. Thank you Grace! Rock gardens are popular here too, mostly with drought- and heat-tolerant plants. You probably don't have to worry about that :), and yours looks lovely. Thank you for the pretty pictures. I hope it brings you much joy. Yes, it does, Masha! You're right, the rains every day, there is no drought here. Your rockery is beautiful! I love alpine plants and I have a few but sometimes they die in my garden. I think they need better drainage so a garden like this would be perfect! Plus the rocks are a nice contrast to the flowers and foliage. My rockery has a bit of drainage, because to make it is a hard work. The plants that badly grow I change on others. Thank you, Ruth! Your rock garden is full of charm and colour. I love it. It's a hard work to do this and rocks are enough heavy, Judy.